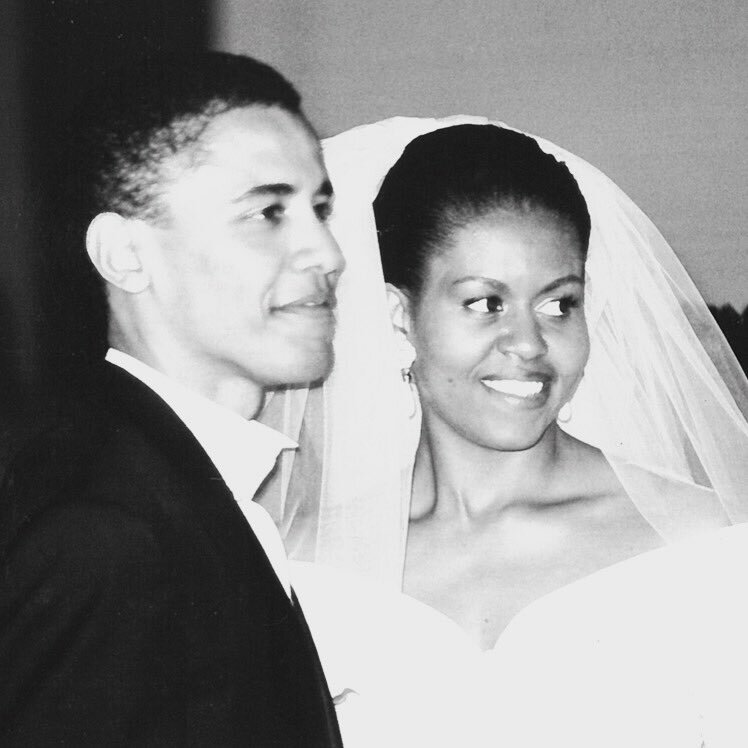 Barack and Michelle Obama's portraits will be unveiled at the Smithsonian's National Portrait Gallery in 2018. 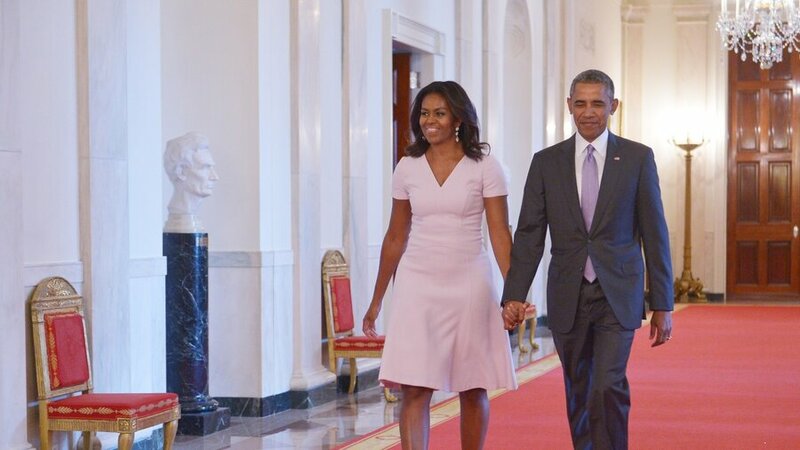 Artists Kehinde Wiley and Amy Sherald will create the official presidential portraits to be kept in the museum. The politicos' selections marks the first time the Smithsonian has hired black artists to create a portrait of a former president since they started commissioning portraits in 1994. 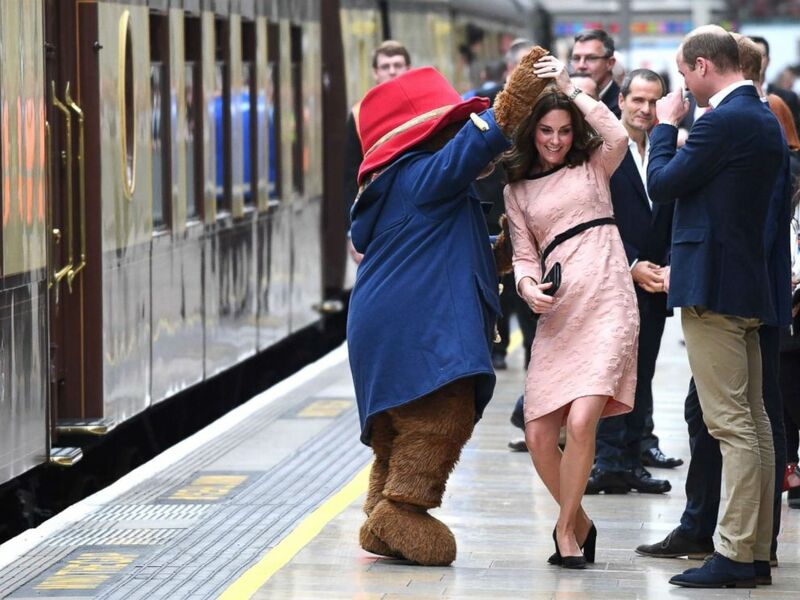 Kate Middleton met with children "going on a very special journey" at Paddington Station in London today. 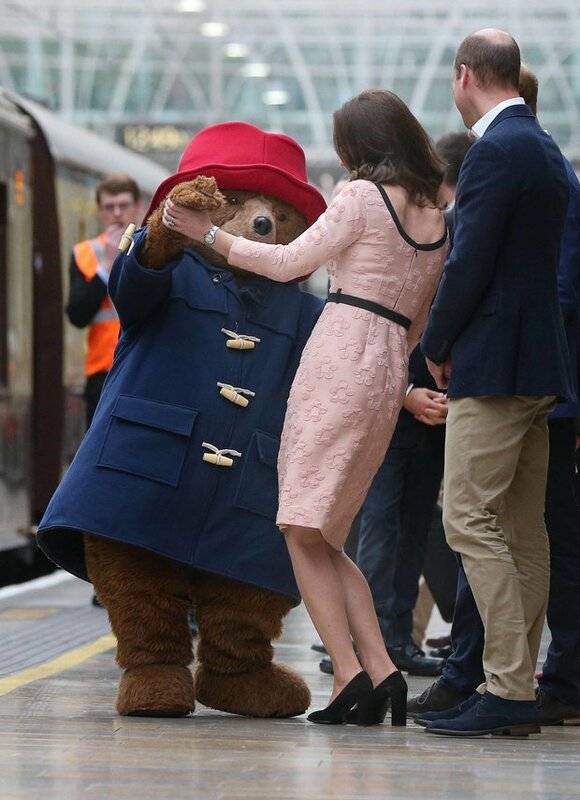 The Duchess rocked a baby pink dress with floral appliqués by Orla Kiely. 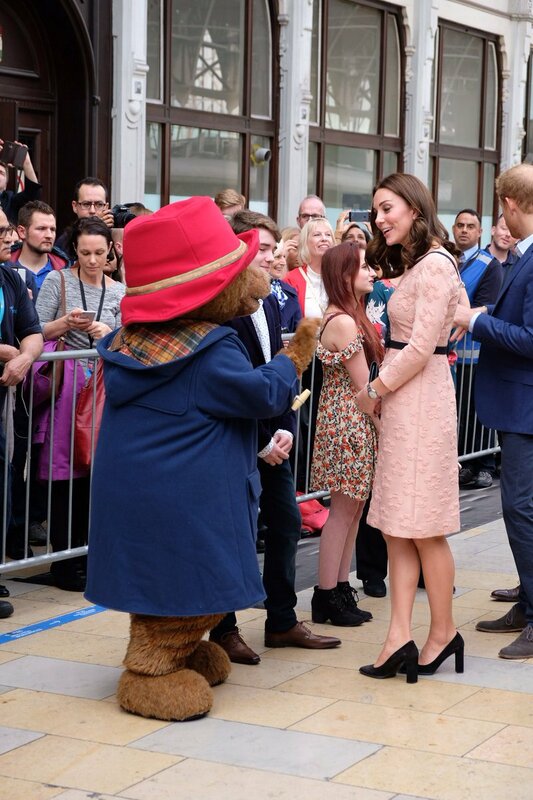 She really looked good with her baby bump as she danced with the children. Bajan pop beauty Rihanna stepped out in New York on Thursday. She was photographed wearing a denim Tom Form blouse on a matching thigh-skimming skirt and a pair of ruched boots with white painted toes. The 29-year-old attended her Fenty Galaxy launch at Vogue's Force of Fashion Conference, Milk Studios in Manhattan. The 2018 Australian Firefighters Calendar has been published. The Calendar was established in 1993 to support the Children's Hospital Foundation to fuel research for childhood burns. The Australian Firefighters Calendar has raised over $2.3 million for various charities since it was launched 25 years ago. In this latest edition hot firefighters pose with different animals for the shoot. If you thought it’s only you who scares away at the thought of exercising, you’re wrong. There are many like you who think that exercising is something that consumes a lot of time and is intense. However, as per recent studies by BMC Public Health, if people could love and enjoy the thought of being active, this could increase the health benefits of exercising. 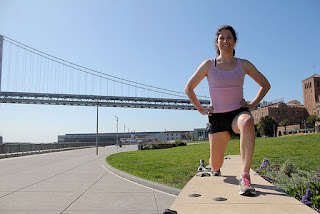 Too often it is seen that people who join in exercising programs usually stop doing them when they see that they don’t lose weight right away. So, if staying in shape and exercising is something that is always pushed towards the end of your to-do list, here’s help for you. We’ve compiled a list of ways in which you can focus more on exercising and tend to love it with every passing day. Here are few ways to love exercising. 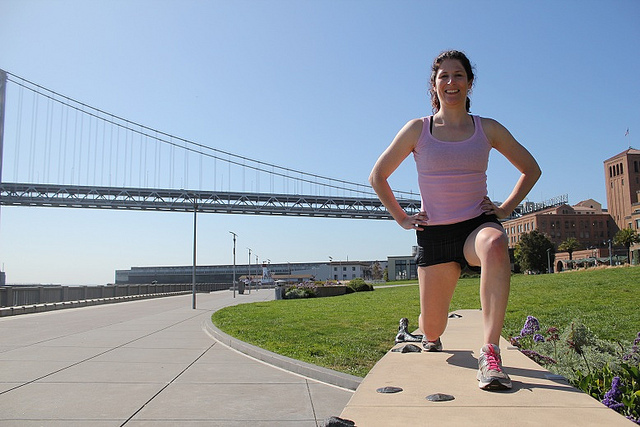 Eliminate the element of thinking everyday whether or not you should do your exercise. If you can succeed in making this as a habit for everyday, it gets easier to go. Find out how you should make your habits stick even though you may feel tempted enough to let go of the same. If you’re someone who visits the gym, make sure you get someone who can visit the gym with you. He or she should be a person who is also extremely committed about his or her health. When you have a friend by your side, this will not only help in socializing but you will also have someone to back up to in case you don’t feel too motivated some day. While you can begin working out by running out until you’re dog tired, you can even show up in the gym, stroll around and just do nothing before getting back home. In the first case, your challenge level remains high but with the second one, there’s simply no challenge. Therefore, it is important for you to set challenges as that is the key to enjoyment. No, it will not be any goals about gaining muscles or losing a set amount of weight but the goals should always be related to fitness. If you have been practicing few things, make sure you set realistic goals which you can accomplish with a little bit of workout. When you have enough fitness goals, gym can become a game where you’ll love to beat the previous score. Don’t be within your comfort zone as that won’t help you realize your goals. So, even when you don’t have enough time to work out for an hour, you can even go out for 20-30 minutes. It is seen that shorter workouts often are better than the lengthier ones as you get more focused on the result. After exercising for an hour, your body can move into a state where there won’t be any physical improvements. Singer Ciara has announced the list of nominees for the 45th American Music Awards on Good Morning America. The nominees are for six categories. 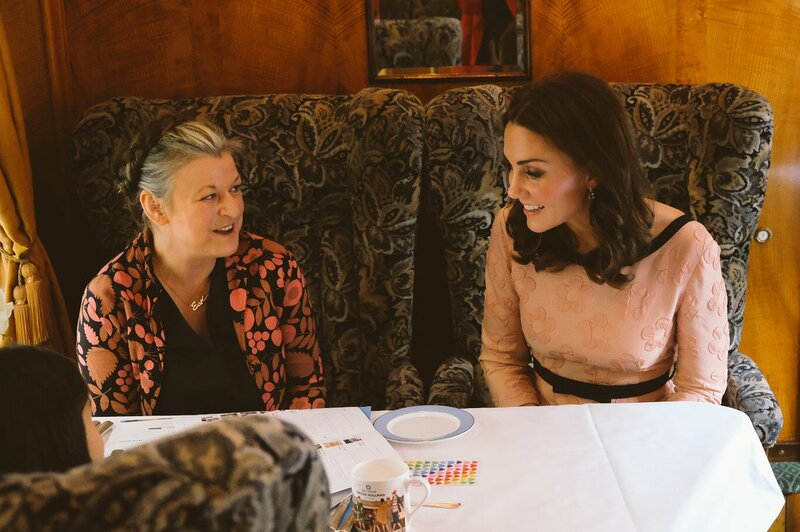 Taylor Swift launches her very own lifestyle app called "The Swift Life"
Kate Middleton joined her husband, Prince William and brother-in-law, Prince Harry to mark World Mental Health day despite her severe morning sickness. 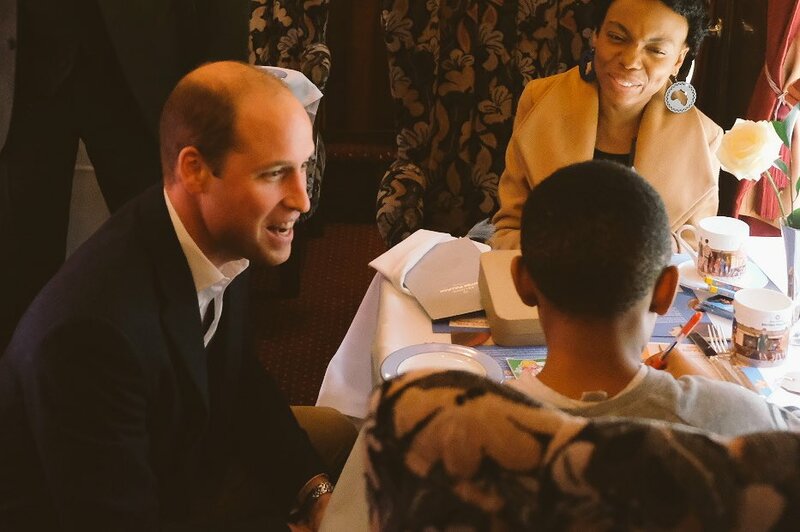 The event was held at Buckingham Palace to honour those working in Britain’s mental health sector. 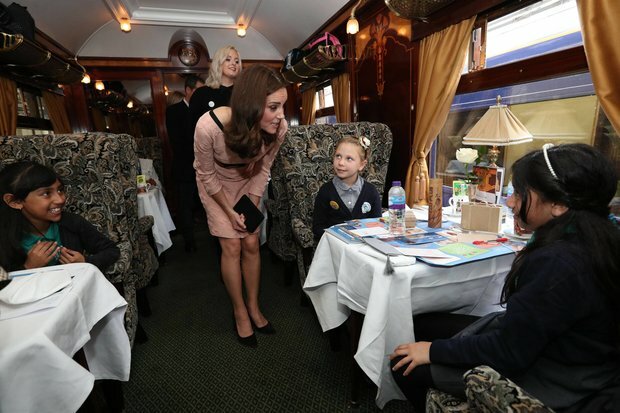 It was her first public appearance since the announcement of her third pregnancy in September. 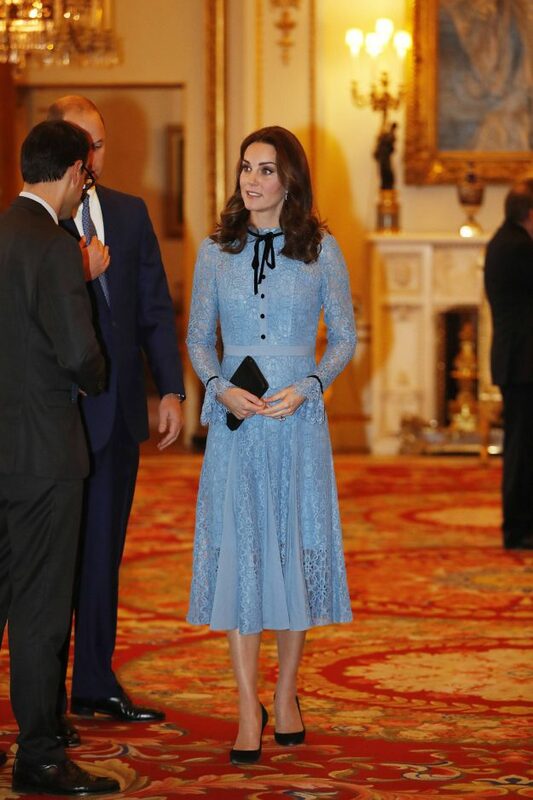 The Duchess of Cambridge rocked a light blue Temperley London dress with long lace sleeves paired with a pair of dark high heels. Rihanna posted an image of herself rocking a beautiful tulle dress on Tuesday. She paired it with a pair of white sneakers, razor thin sunglass, a Rolex, a chain necklace and a seek topknot. 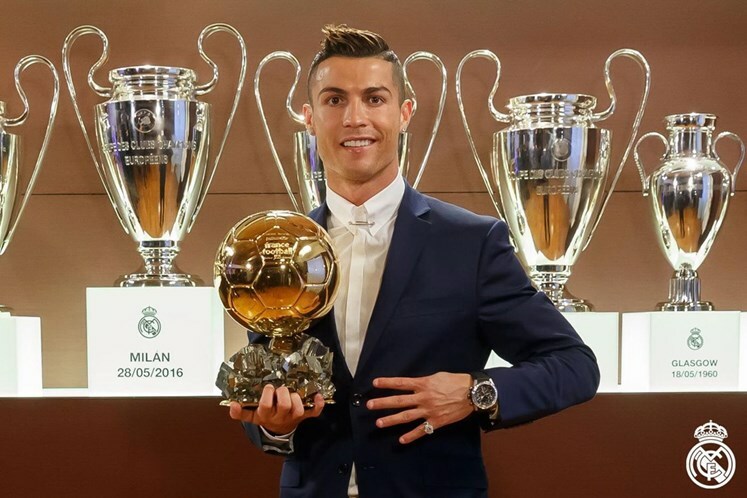 Cristiano Ronaldo has auctioned the replica of his 2013 Ballon d'Or for charity. The award was purchased by the Israeli millionaire and philanthropist Idan Ofer for $705,120. 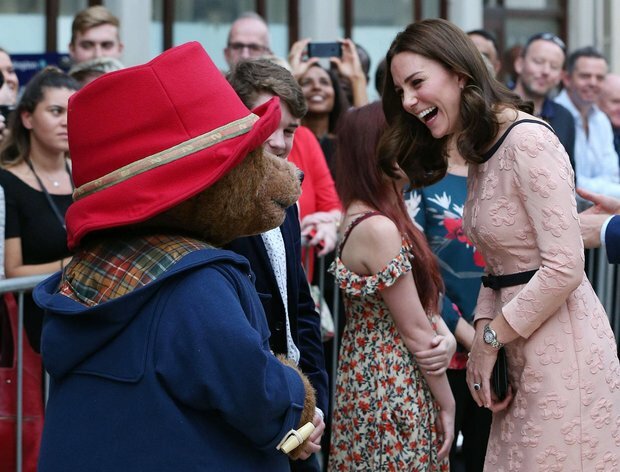 The funds will be used to care for children fighting life-threatening conditions. 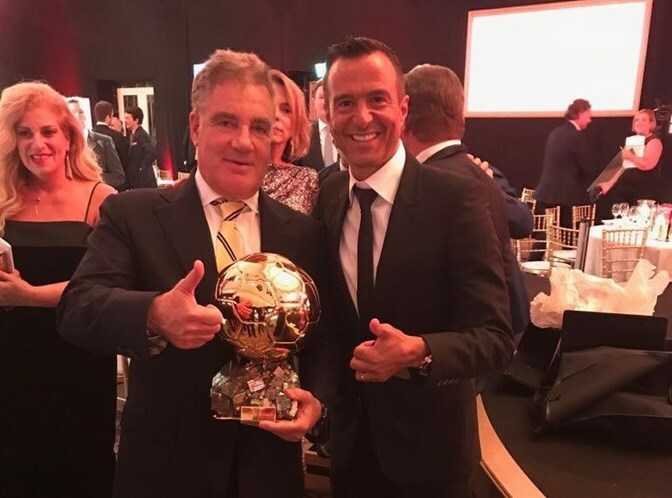 When a player wins the award, they get the original and a replica is also provided that sometimes goes to the club. The 32-year-old footballer has four of the trophies. Welcome to the world of freelancers! Gone are those days, when you had to run to the office and work for 9 hours. 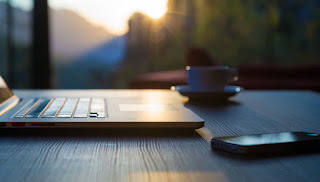 There are many people in the world, who are doing freelance jobs and they are earning enough to support their family and fulfill their personal needs. There are few people, who are doing a fulltime job and handling self-employed work. Freelance management is critical here. If you are a copywriter, you have to abide by the deadlines of the clients. Today, we have covered some time management strategies for you. You can earn a fortune by freelancing, but you need to prioritize and manage your time. 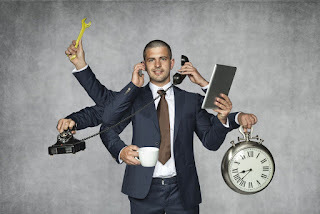 This post will help you to understand the basics on how to manage your time while freelancing. These are the 5 tips on how to plan your time productively. If you follow these golden tips, you will be able to earn more and not add additional stress to your life. These time tracking tips have worked for many people. If you wish to focus on the important projects, you have to say goodbye to social media sites while working. Switching off your phone and not checking your social media updates will be helpful. Get rid of the distractions such as Gmail, Skype, Facebook, Instagram, Twitter and even WhatsApp. You do not have to check every update. The world will not come to an end if you do not check your phone for a while. Not everything in life is urgent, and you need to save your quick responses. Turn off your phone and concentrate on your work. Take short breaks in between. You can take 5 minutes break after every 30 minutes. You do not have to sit for an hour because that hour will not be as productive as those 30 minutes. You can take the five minutes break for a quick cup of green tea or having a warm cup of coffee. Stretch some and maybe dancing on your favorite song because your mind needs this five-minute break. Life is not about pleasing other people. Firstly, you need to get rid of people, who are constantly distracting you. If they have made plans or they wish to talk to you, just learn to say NO. What are your priorities? Take your freelance work as a 9 to 5 job. If your mom is standing next to you or your friend is regularly calling you, tell them you are busy, and the work is important. I am sure that they will learn to respect your time and work. Freelancers are not people, who have a lot of time on hand. They may have more work than an office going person. They may have to work at 3 A.M of the morning to finish an important assignment. As I said, treat your freelance job as a full-time job. You are getting paid for the work, and it is important for the client. Your client should be your first priority because they trust you and hand over the work to you. We have a great idea! Wake up in the morning, brew some coffee, shower and get ready like you are going to office. Make a workspace in your home which includes a table, chair, and your laptop. Dress up for the freelance job and take it seriously. Set up hours in the day when you will be working. You need to understand that time management system is important. You take too many projects, and now you have no idea how to complete it! It happens with me all the time. You need to create a realistic deadline. As a freelancer, you would love to take as much work to earn more but finish what is on your plate first. Take up as much work that you can handle. Do not take up projects that you will not be able to finish within the deadline. You have your entire life to earn money. If you take too many projects and tell the clients that you will finish it in a day, there are chances you will feel the pressure in your head. Do not take too much of stress! Do not put a strain on your head because a human mind cannot take much pressure. If you find yourself struggling to finish the works within the deadline, it is time to use the above-mentioned strategies. This post is for all the freelancers, who are finding it difficult to come up with the projects. Once you learn an art of time keeping, nobody will be able to stop you from earning a fortune. There are freelancers, who are making thousands of dollars by sitting at home and writing. Just so you know, this is serious work that the freelancers do. People feel that freelancers have too much free time, but it is not true. They are busy creating masterpieces for their clients from all over the world. As a freelancer, I have heard a lot of comments, but at the end of the day, I get my fat paycheque which gives a boost to my ego. Do the comments of people bother me? The answer is a resounding NO! Jeremy Raynolds is a Self-Employed Content Writer, who writes academic content for https://eduzaurus.com. He possesses a Master’s degree in English Literature. He did a diploma course in Spanish, and since 2016, he has been teaching the subject to online students. His interests include photography, composing poems and songs. 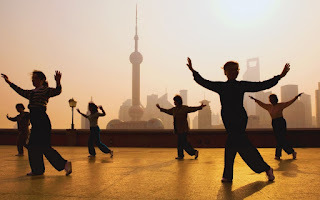 These days, many people from the whole world already know about the benefits of Qigong, but there are still plenty of those asking about Qigong and Tai Chi benefits, Chi Gung benefits, and what are the advantages of Tai Chi at all? In this article, I try to give you the most relevant information why Tai Chi and Qigong must be a part of your everyday routine in order to be healthier and stronger, both physically and mentally. This piece will be also useful if you want to make meditation and relaxation the part of your life as well as find new sources of calmness and peace. But if you simply want to find some new resources of inspiration, then just hop over to here in order to make at least one part of your life a little bit easier. But let’s get back to our topic, and let me tell you some interesting historical facts about the mentioned notions, and, of course, present you the Tai Chi definition. 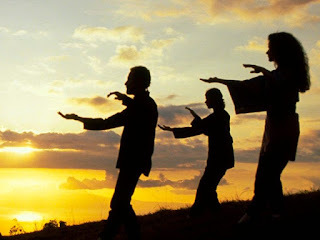 Tai Chi is a branch of Qigong, which has been practiced for more than 2,000 years. It's hard to believe, but Qigong has a longer history - about 5,000 years of existence. As you've already guessed, it was originated in China. The main purpose of this practice is balance and harness, the energy of life. In fact, usually, these notions are described as meditation in motion with slow, gentle movements. It's also characterized with full concentration and complete attention on your breath. At the first glance, these exercises can seem extremely easy and useless, but believe me, in this case, the appearances are really deceptive. 1. One of the most significant Tai Chi health benefits is the fact that this set of exercises will be useful for all ages and fitness levels. 2. It can improve your bone health and muscle strength. 3. Improves balance and hand-eye coordination in elderly people; they are less prone to falls that cause serious injuries. 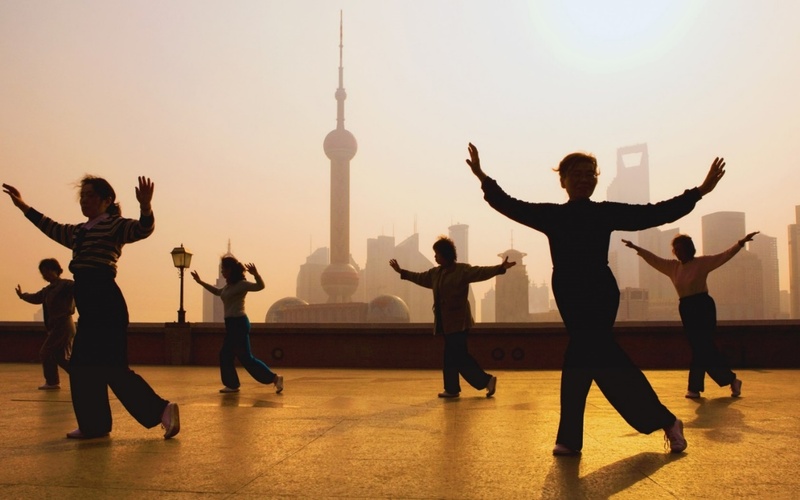 As a result, many people all over the world choose Qigong for health improvement and mental development. 4. Eases chronic pain, improves physical function, and strengthens joints and muscles in those with fibromyalgia and arthritis. 5. The meditative aspect of Tai Chi combined with the physical movements create a calming effect on the mind and body, thereby lowering stress. This reason is one of the most important for many people, who are looking for calmness, balance, and conciliation in our modern hectic world. 7. Many people in the world suffer from chronic and acute insomnia, and with Tai Chi complex exercises, this problem can be solved easily. 15. Boosts the general wellness and wellbeing. Are you still wondering why Tai Chi is the good option for those, who want to have a healthy body and soul? If tyou find at least one of the aforementioned benefits of Tai Chi important for you, try performing this set of exercises every day in order to be strong, both physically and mentally. Besides, the benefits of these practices are recognized by many researchers, showing that Qigong and Tai Chi provide positive psychological and physical results. For instance, according to Traditional Chinese Medicine, it helps to improve your overall well-being, stimulates the central nervous system, lowers blood pressure, relieves stress, and tones muscles. Another extremely significant benefit of Tai Chi is that even the elderly can train their body in order to maintain their physical and mental health. Moreover, people confined to a wheelchair can also practice it, as they realize that one of the worst things people can do is to stay inactive. Don't forget that while you are practicing Tai Chi, your mind should focus on relaxation, your movements, and deep breathing instead of all annoying thoughts. Finally, try to live in a full harmony with your body and soul, feed your mind only with positive thoughts, and never give up in order to be healthier, stronger, and more productive day to day. Rihanna, 29 shared an image of herself rocking a pair of Saint Laurent white over-the-knee feather boots on social media. Ciara shared photo of her daughter with Russell Wilson, Sienna on social media. The singer and her kids went to watch Seattle Seahawks game on Sunday. They all wore matching Russell's Jerseys. The couple welcomed their daughter in April. 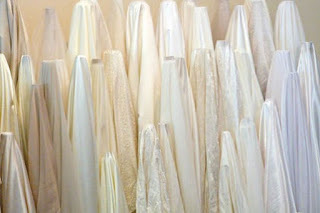 Shopping for a wedding dress is a large task for a bride to be. 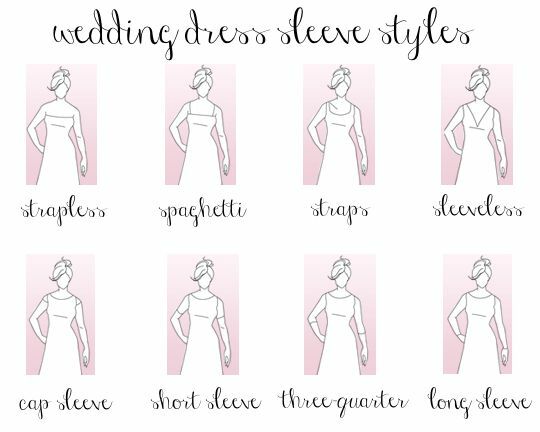 There are many decisions to make on what type of dress suits your style, compliments your body type and fits the venue of your wedding. The process of choosing the perfect wedding gown can be quite a task. If you first learn the terminology used by the professionals, you can start your fun and fascinating journey and make it easier on yourself. 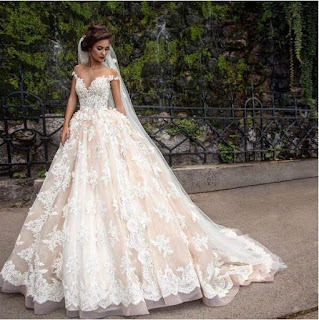 It’s hard for you to get the type of dress that you’ve always dreamed of if you don’t know what it is called, but have a picture in your mind. You may choose a traditional and classic style, a newer trendy style, or a mixture of both. Choosing the style you want first allows you to move on to the construction details. 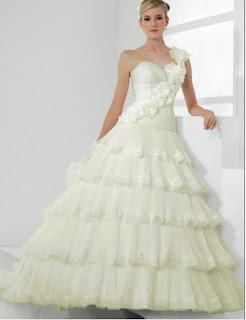 A-Line-has a fitted bodice with a slight flair in the skirt. 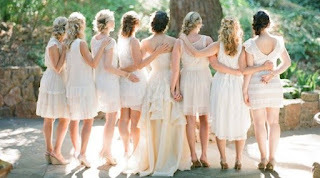 They are a popular choice of brides with a classic style that suits any body type. Asymmetrical-These are a newer style of wedding dress that includes one shoulder strap or layering of material that creates an uneven hem at the bottom of the skirt. 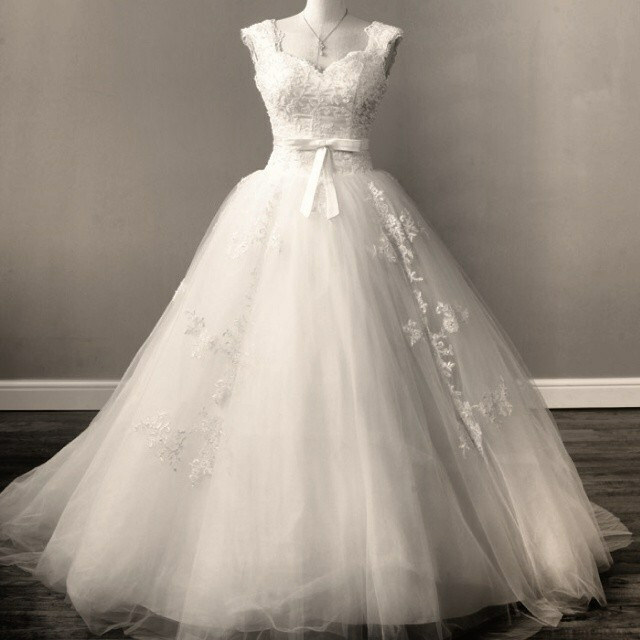 Ball Gown-This is reminiscent of the fairytale princess. 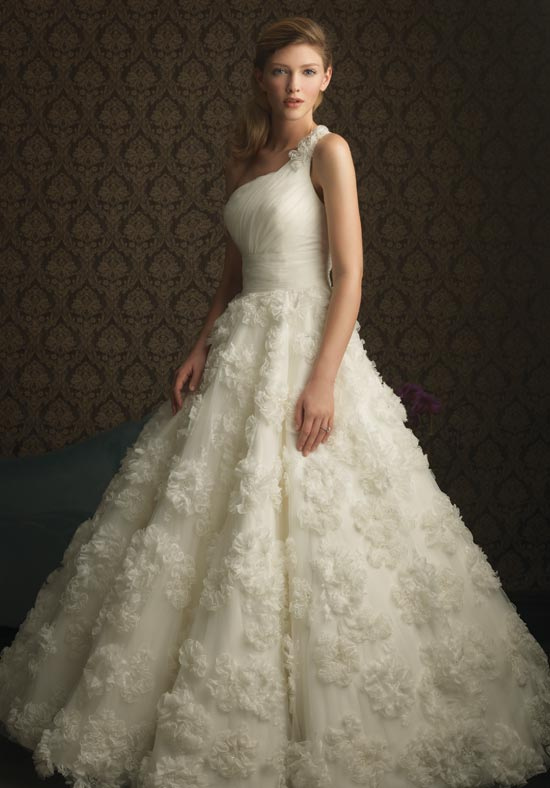 It incorporates a long, flowing skirt and a fitted bodice with a very full skirt under which you can choose to add petticoats or hoops. Blouson-This style is very blousy with a gathered waist at the natural waistline or a few inches below. 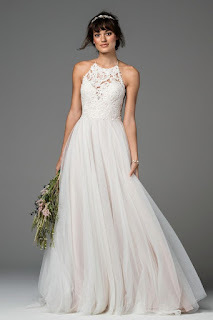 Drop Waist-This type of dress has a rather loose or fitted bodice with styling that draws the eye to the area below your waist or near the actual waist. Empire-The empire style dress includes a high waist that is drawn in just below the bust. This style elongates the body of a shorter woman, minimizes pear shape women and can conceal a bust that is very large or very small. Mermaid-A mermaid dress is also called a fishtail or a trumpet dress. It hugs the body and begins to flair out in the skirt about knee length. The flair can be extravagantly large or small and modest. This type works very well on tall women that have an athletic build to accentuate the figure. 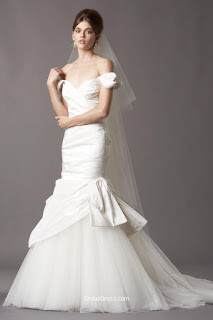 Mini-A mini wedding dress has a hemline that falls at or above the knee. Princess-A princess gown is made from vertical panes and can be an A-line or have a larger flare in the skirt. It is quite a slimming design for most all body types. Sheath-This style is long and slim in a body hugging design without a fitted waist. 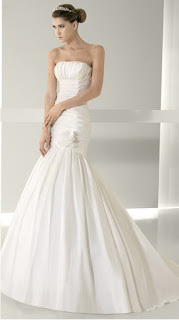 After choosing you basic style, you then need to decide on the construction and specific dress features that you want. Boat Neck-This type has a neckline that rests on the points of your shoulders to reveal your collarbones. It is sometimes called a bateau. Cowl Neck-The neckline in this type has loosely draping fabric that can be low or high at the neck and bust. Drop Shoulder-This style is sleeveless with bands that start below the curve of your upper arm. Halter- The halter-top is angled diagonally on the outer bust and fastens behind the neck. Jewel-The jewel style has a neckline that follows the curve at the base of your neck and it does not have a collar. 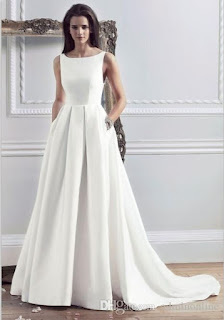 Portrait Collar-This type of dress will be a drop shoulder neckline with a folded collar that can be exaggerated. Sabrina-The Sabrina style has a straight neckline that begins well inside the curve of both shoulders. Scoop Neck-The scoop neck style is U-shaped with a curve at the bottom. It can be very daring or extremely modest depending on how low you want the neck. Spaghetti Straps-The neckline is held up by very thin and delicate straps on each shoulder. 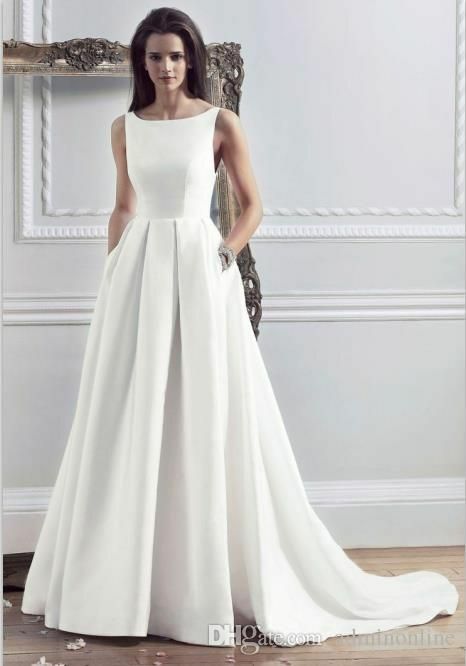 Square Neck-This neckline is horizontal across the bodice front and it ends with sheer vertical straps or may have shaping on either side of the neckline. From the front, it appears as the shape of a square or rectangle. 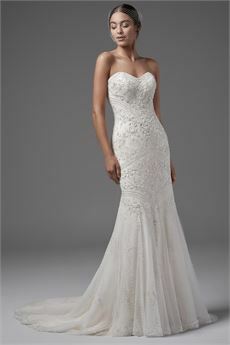 Strapless- This style has no straps to hold it up and leaves your shoulders bare. The bodice of the dress holds the top up. 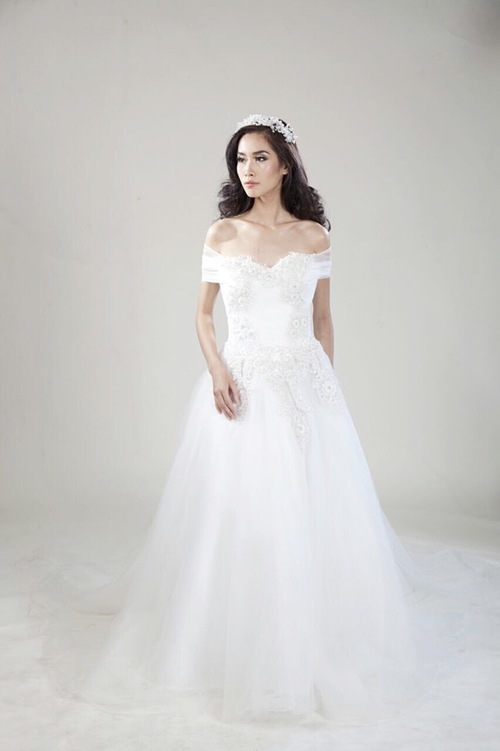 Sweetheart-The sweetheart neckline has a curve over each breast and dips into a shallow or deep V at the bottom. 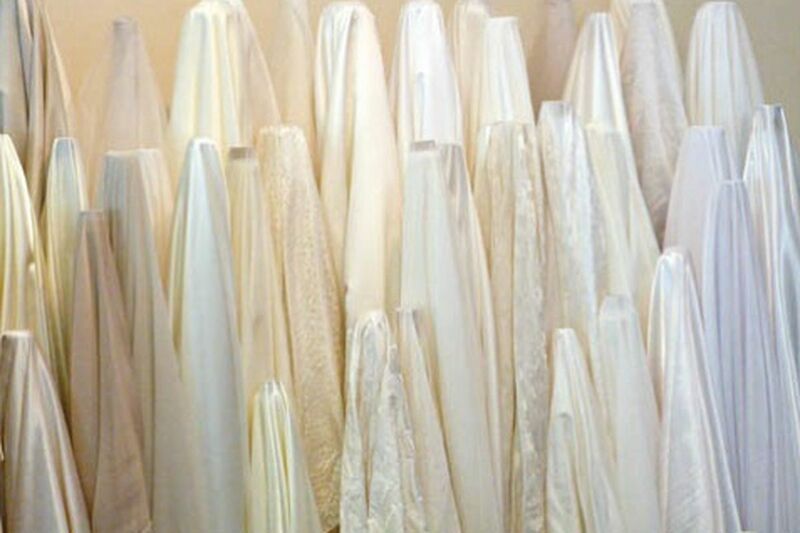 You can choose from several hem lengths in a wedding gown. The Ballerina is at or just above your ankles while floor length either brushes the floor or is slightly shorter than that. 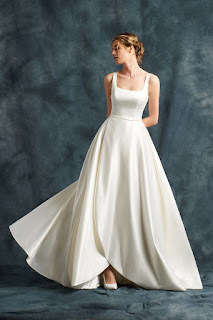 The hi-lo skirt hem is at the mid calf in the front and is a dramatic floor length in the back. A mini shirt is above the knee, a street skirt just covers the knees and tea length is a few inches above the ankles. 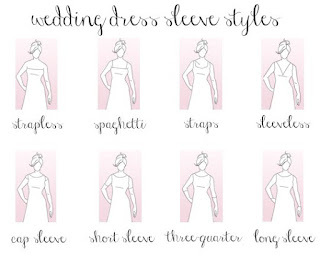 You can also choose from a large variety of sleeve types. The bell sleeve is snug down to the elbow and then it flares out to the wrist. The capped sleeve is very short and slightly rounded to only cover your shoulders. The dolman sleeve is joined to the bodice above the elbow level and then it tapers to the wrist. A kimono sleeve extends into the main column of the gown and then lengthens deep and wide to the wrist. The puff sleeve is gathered or pleated at the shoulder and can be small or very large. Three-quarter length sleeves end between the elbow and the wrist while tulip sleeves are formed with overlapping fabric in petal shapes. There is an immense amount of fabrics for wedding gowns. Some of the more common are in this list. Heavy Fabrics-brocade, crinoline is a foundation for an underskirt, satin is shiny and smooth, shantung is rough textured, taffeta has a slight sheen and velvet is the heaviest fabric. 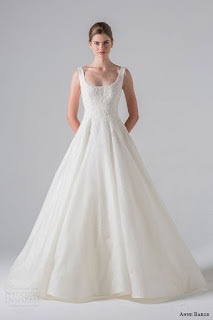 You can also choose to have your train on your wedding gown as a part of the dress or have it made separately so you can detach it for comfort. 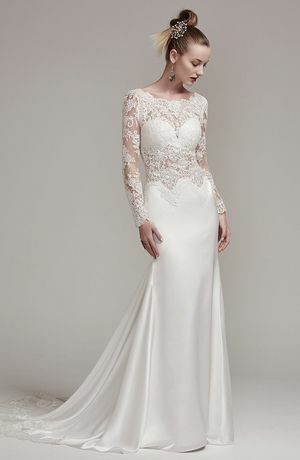 Choosing your dress for the most important day of your life is a process. Contact a professional at Sydney’s Closet to help you to be picture perfect on your big day.